With the Data Digester Standard Edition (SE) you hold the perfect solution for message digests (aka checksums) and OpenPGP signatures in your hands. The inituitive application window is easy to use, so you can generate checksums and OpenPGP signatures even for whole server file systems with only a few mouse clicks. If you are a system administrator, you may want to use the command line interface digestercli to deploy the Data Digester software for your scripts and applications. The refresh mode helps to minimize the generation costs since only new or updated files are being processed. The Data Digester Standard Edition has a built-in file system navigator where you can easily select single files or whole directories to be processed. Using the new Digester XML file format it is possible to generate and store arbitrary checksums, intermediate digests, and OpenPGP signatures together in one file. The generation template support allows you to configure the application to generate the digests/signatures appropriate for different environments (e.g. FTP server, multimedia archive, server backups). Generate and examine checksums like MD5 or SHA. Create and verify OpenPGP signatures. Supports GNU, BSD, and the new Digester XML file format. Create files with multiple checksums. Process single files, directories, or whole file system trees efficiently and fast. Create digests/signatures for different environments with generation templates. Manage OpenPGP keys comfortably, create/import/export OpenPGP keys. Be platform independent. Runs on Windows, Mac OS X, Linux, and many more systems. Use the installers or execute the application directly with Java Web Start. Call the command line interface from your own applications. Support for Ant build scripts. While the Data Digester Basic Edition is limited to examine checksums and to verify OpenPGP signatures, such files can be generated with the Standard Edition. It is the perfect solution for those users wanting to equip their download servers with checksums or the more secure OpenPGP signatures or both. Checksums and OpenPGP signatures can be deployed in almost all situations where important files must be secured against data corruption or manipulation. Checksums and signatures should be generated for server backups, multimedia archives (image, audio, video), medical and scientific documents, CAD project files, scanned documents, and many more mission-critical files. Currently, the Data Digester supports the following message digest algorithms: MD2, MD4, MD5, RIPEMD-128, RIPEMD-160, RIPEMD-256, RIPEMD-320, SHA-1, SHA-224, SHA-256, SHA-384, SHA-512, Tiger, and Whirlpool. The Data Digester software provides many ways to generate checksums and OpenPGP signatures. You should start with the Generate Wizard where you can choose the target files, select the desired message digest algorithms, and setup some basic options for the generation process. Then the most flexible way is to select single files or directories from within the built-in file system navigator window. Choose the desired message digest algorithm or OpenPGP key from the context menu (right mouse button) and the files are being generated. You will find all available options for the digest/signature generation centralized in the Generate docking window. Here you can adjust the message digest algorithms and associated file extensions, the file format options, the OpenPGP keys used for signatures, the many options to finetune the new Digester XML file format, as well as the options controlling the refresh mode. 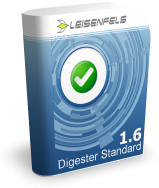 Of course, all features of the Data Digester Basic Edition are also supported by the Data Digester Standard Edition. To check single files or file collections it is necessary to store the computed checksums for the original files into checksum files. Normally these checksum files are stored together with the original files for example on magnetic tape which are then delivered to a safe place like a bank safe. In the emergency case such backups can be restored. On the Internet you can find checksum files predominantly on FTP and other download servers. Normally the checksum files are named after the original files by adding a distinctive suffix such as .md5 for MD5. The most common file format used for checksum files on the Internet is the GNU format. The data is stored as text lines each of which holding a calculated checksum for exactly one single original file. Another widely used file format for checksum files on the Internet is the BSD file format. Like GNU format files, the checksum values are stored as separate text lines for each original file while the line format is slightly different for BSD format files. Wherever possible the new Digester XML file format should be preferred which can be used very efficiently together with the Data Digester software. Here you can also create single checksum files for each original file but the checksums can also be bundled together in arbitrary combinations even over drive boundaries. Another advantage of the Digester XML format is the capability to store intermediate digests. While GNU/BSD files can only contain one single checksum for each original file, the use of Digester XML files allows to store as many digests/signatures as desired. Unnecessary to mention that Digester XML files can also contain OpenPGP signatures, so it's one format for all. Here you can view some Digester XML examples. Especially in environments with large amounts of data files it is necessary to process the files for whole directories or even whole file system trees at once. The Data Digester software has built-in support for such batch processing, implemented for both, checking and generating. The most convenient way is to select the desired directories in the built-in file system navigator window and to start the checking, generating, or refreshing process by clicking one of the buttons provided by the docking windows on the right side of the main window (default configuration). If configured, the subdirectories are processed automatically, so there is no need to select the directories one after another. If you like to check and generate digests/signatures on remote file systems connected with common network protocols like FTP/SFTP then the Data Digester Enterprise Edition could be the right choice for you. If you are a system administrator managing multiple server systems, each with a special file system structure and probably different requirements for checksums and OpenPGP signatures, you need a flexible solution like the Data Digester Standard Edition. The generate options can be stored as templates. This allows each of your servers be processed specifically with one tool. For example, your server may provide FTP download files. Here, MD5 and SHA files each containing one single checksum are appropriate. If you like the files be authenticated also, then additional OpenPGP signature files should be generated. You only have to setup the generate options once, store a template, and now you may generate the digest/signature files appropriate for this server very easily. Of course, generation templates may be duplicated or transferred to another PC so your configurations may be easily shared with other users. This is also a convenient way to setup the Data Digester software on systems lacking a graphical environment e.g. if you work remotely on a UNIX system. The generation templates may be directly specified also as command line arguments for the digestercli application or for Apache Ant build scripts using the natively supported Digester Ant task. The Data Digester software has a built-in OpenPGP engine (Pretty Good Privacy) to create and verify signatures according to the OpenPGP standard. You can easily create new key pairs consisting of a private and a public key. The private keys are used to create signature files while the public keys are required to verify your signatures. While the public keys can be published e.g. on your website, the private keys and the associated passphrases must be handled with care to avoid misuse. OpenPGP signatures allow for more security compared to checksums since downloaded files may also be authenticated. If a OpenPGP signature created with a well-known public key could be successfully verified for a downloaded file, the file is both valid (not corrupted or manipulated) and it originates from the creator it claims to originate from. If you already have generated OpenPGP key pairs, it is possible to import them into the Data Digester software with a few clicks. Passphrases may be stored securely along with the keys in order to support non-interactive processing and command line operation. It is also possible to enter the passphrases each time OpenPGP signature files are being generated. OpenPGP keys may be exported to be used by other OpenPGP applications like GnuPG or the enigmail plugin for Mozilla Thunderbird. The Data Digester software is written in pure Java which allows the software to be executed on almost any platform on the market. If your environment changes from one platform to another, chances are good that the Data Digester software can be migrated without problems to the new platform. The obtained licenses are still usable no matter the platform. This gives system administrators the flexibility to migrate from one platform to another without generating additional software license costs. Future versions of the Data Digester software will add Android support for mobile devices like smart phones and tablets. So the marketing slogan "Write once, run everywhere" becomes reality. The Data Digester software can be executed in two ways: from a classic installation or directly using Java Web Start. Installers exist for Windows, Mac OS X, and Linux/UNIX systems. There are currently two Windows installers available, one including a Java runtime environment (JRE) already. Additionally, a DMG installer for Mac OS X is available as well as a universal shell executable installer for Linux/UNIX operating systems. All installers can be executed either from the command line/shell or in a graphical environment. The Data Digester software may also be run directly from a website by clicking the Launch button (an appropriate Java runtime environment must be installed on the PC). The application is then downloaded and started right away. If the software is started the next time using the desktop icon or the link again, the application is not downloaded again but started from the local cache. There is no need for time consuming installations, so Java Web Start is the ideal mechanism to execute the Data Digester software on a customers' site, on temporarily used PCs, or mobile devices like notebooks. Use the command line interface of the Data Digester Standard Edition called digestercli to check or generate checksum and OpenPGP signature files on those computer systems lacking a graphical user interface (e.g. from a remote system). The Data Digester software implements the Apache Ant task interface to support Ant build scripting natively. Let the Digester GUI generate the command line arguments and Ant task definitions for you, so there is no need for additional programming. Please take a look at the command line arguments for the Check, Generate, Refresh, and Sync operation modes of the command line application digestercli. Here you can view the Apache Ant examples.